"Erected by Lilley Eaton in 1804, this house at the corner of Main and Salem Streets was said to be by far 'the most imposing dwelling in the village and occupied a position which was then accounted the centre of population and business for the South Parish.' A shoe manufacturer until his early 30's, Lilley Eaton opened a country store in his home which he operated until his death in 1822. For three of those years, from 1809 to 1812, it was operated by T & A Evans. In 1813, Lilley Eaton opened the first temperance grocery ever kept in the town. As a 'pillar of the Baptist Church and Society' he furnished for many years, free of charge, a room in his house for the society to use for their religious, social and conference meetings. An unfinished hall on the third floor was used on Sabbath evenings and was known in the family as the Meeting Chamber. The house was also known as the 'Pilgrims' Hotel' because it was a 'general resort' of traveling clergymen, and other brethren and sisters of faith. His son, Hon. Lilley Eaton, was born in 1802. He went on to be instrumental in the town, serving as Selectman for 25 years, a member of the school board for nearly as long, Town Clerk for 20 years, Representative for seven years, Senator for two years, Justice of the Peace for 38 years, and a member of the Constitutional Convention in 1853. He was instrumental in establishing the Mechanic and Agricultural Institution. The house was torn down in 1913. " -- Text from calendar by Jayne M. D'Onofrio. 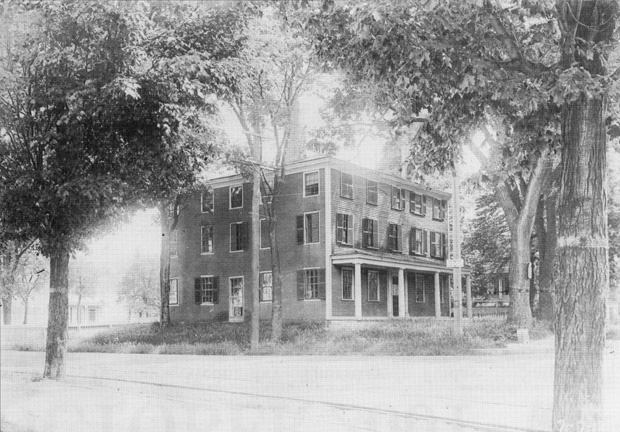 “Lilley Eaton home, corner of Main and Salem Streets, circa 1912,” NOBLE Digital Heritage, accessed April 22, 2019, https://digitalheritage.noblenet.org/noble/items/show/7007.